1. 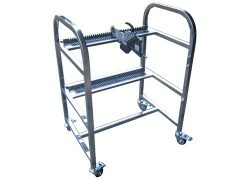 The feeder storage cart gives your operators a secure place to put unused feeders between set-ups minimizing failures due to improper storage or handling. 2. When its time to prepare for the next job, the same carts can be used to “pre-kit” the placement systems tape feeder load in positive latching feeder locations using the same numbering system as used on your placement machine. 3. When its time to change over to the next job, the cart is moved to the correct placement system, existing feeders on the assembler are moved to an unused shelf on the cart and the “pre-kitted” feeder set move from the numbered slots on the cart to the same number slot on the machine. 4. You can even dedicate on cart for use when removing the tape feeders from the previous job and another for the current set-up minimizing changeover time.